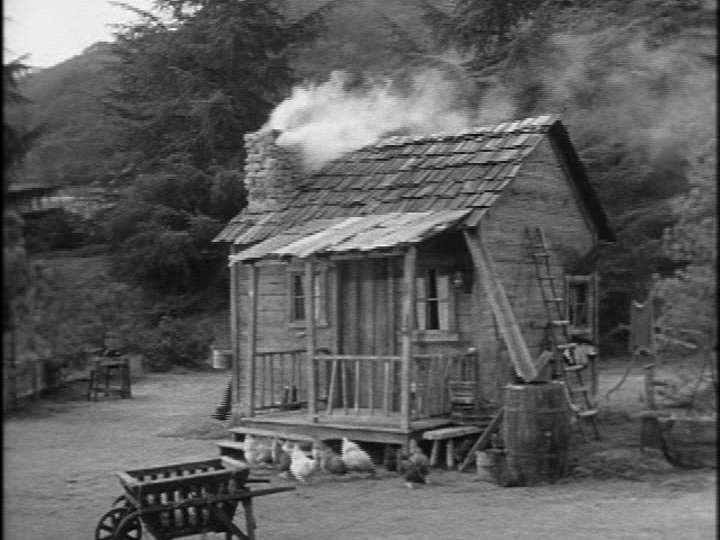 The Beverly Hillbillies is a one-joke show. There is no way to argue around that basic point. Many popular shows have simple formulas, but an important difference is that The Beverly Hillbillies never made any pretense of being anything other than a one-joke show. Paul Henning, producer and primary writer, simply chose to perfect it. Moreover, Henning, who also gave us The Real McCoys, Petticoat Junction and Green Acres (I will forever love him), chose to exploit the best joke we have: “The Great American Joke.” The phrase was coined by Louis Rubin in his seminal essay of the same name first published as the Introduction to his edited collection The Comic Imagination in American Literature (New Brunswick, NJ: Rutgers UP, 1973). It remains a useful framework for teaching and enjoying American humor. In short, Rubin claims that the essence of American humor derives from the ever-present gap between our lofty ideals, on the one hand, and the harsh day-to-day reality, on the other. This incongruity provides a wealth of fodder for humorists. The key, however, is that the joke depends on the perpetual but often sublimated discomfort we experience in relation to that gap. We are culturally conflicted by a neurosis that encourages us at one and the same time to seek higher status (climb that ladder) and also to believe with religious fervor that we are all created equal—that there is no legitimate status to seek. That paradox—or schizophrenia—provides a perpetual sore spot for humorists to poke. Of course, the United States is not the only nation to produce humor based on inequalities and social tensions; it is simply the only nation to start with a theoretical governing principle that rejects the existence of inequality altogether. In American humor, the slobs get the best lines. 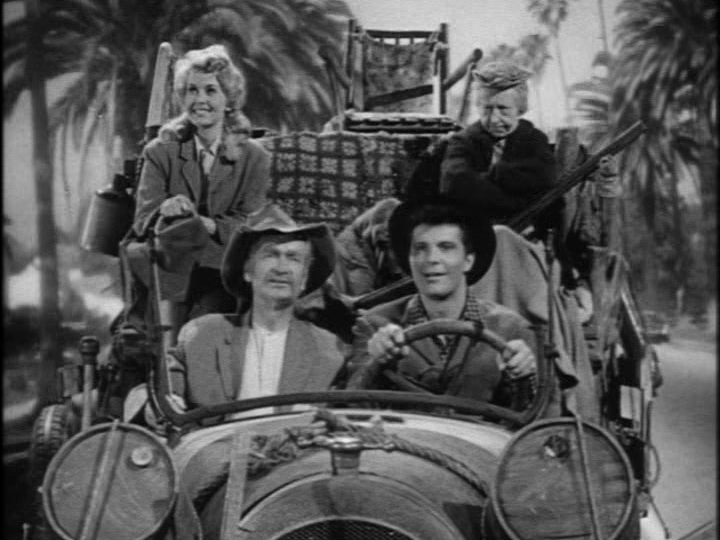 The premise of The Beverly Hillbillies applies “the great American joke” reduced it to its basic framework: make poor people rich; place them in high society; laugh as they struggle to adjust. It is a simple fish-out-of-water formula, and the humor derives primarily from the cluelessness of the Clampetts regarding this brave new world they enter—a swimming pool becomes a “cement pond,” etc. Their ignorance is funny. But that is only half of a successful application of “the great American joke”; the Clampetts also serve as a subversive force undermining American respectability as represented by those fortunate ones who are at the top of the American social ladder in Beverly Hills. So the humor also arises from the superficiality of high class values that are rendered absurd when placed in sharp contrast to the innocent simplicity of outsiders like the Clampetts. 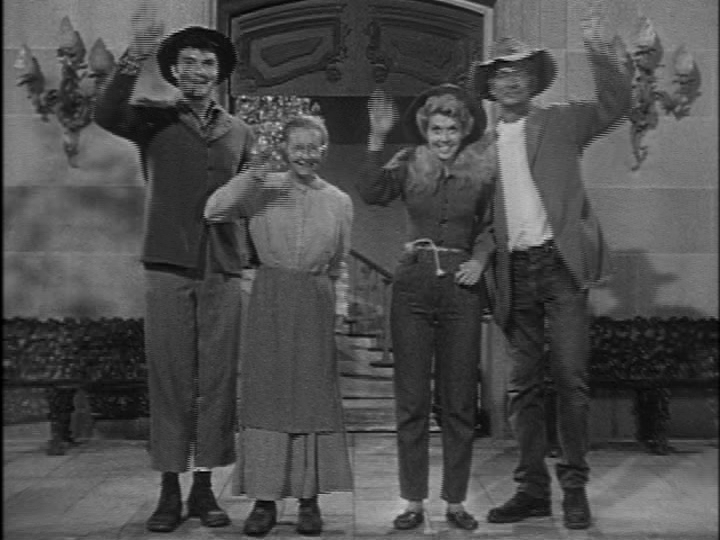 Every episode of The Beverly Hillbillies runs through a variation of the great American joke with sterling success as the audience numbers reveal. A subversive home for the Clampetts in the Ozarks. I try to convince students to love it, too. On the whole, they, just like my daughter, are not very impressed with the show. (I should note that they laugh heartily as we watch scenes.) As a forum for critical thinking, the show offers a useful way to explore important social issues along with the patterns of situation comedy, and the mechanics of humor. Moreover, it rewards viewers with emotional and intellectual pleasure. In discussions, we consider how audiences found it familiar and reassuring, especially as the 1960s quickly became a much more complicated place outside of the family sitcom dream world. We also critique the southern/hillbilly stereotypes that are central to the conceit of the show. Although it exploits substantive social tensions, the Great American Joke is nonetheless comforting and reassuring in that it continually asserts the implied dignity of subversives. The Clampetts are an ideal foil for the power elite of Beverly Hills. Yes, they are comic stereotypes, but such simplistic portrayals become palatable and even lovable when complemented by the core fact of their decency. The Clampetts are uncompromisingly nice. And they are rich to boot! 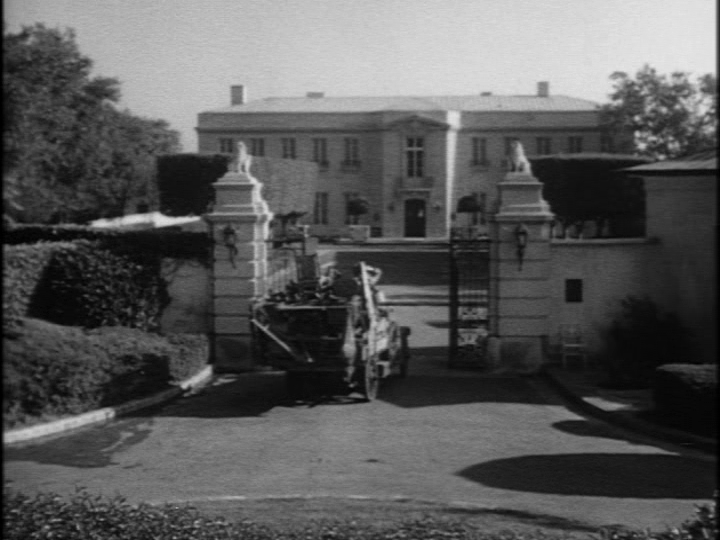 A respectable home for the Clampetts in Beverly Hills. And that is the key to the success of this “dumb” sitcom. We all dream to be rich, and, despite much evidence to the contrary, we also believe that once rich we would retain our own core value system. That is rather delusory. Yet, the Clampetts actually pull it off. They retain their dignity and value system. They are not simply funny; they are dignified and respectful no matter how often they seem buffoonish on the surface. Whereas the applications of “the great American joke” are entertaining if predictable, it is this assertion of values that made The Beverly Hillbillies a huge hit. It may offer a ridiculously simple premise as a setup for countless equally simple sight gags and verbal play, but The Beverly Hillbillies celebrates our favorite premise and our favorite punch-line, and, in the end, our favorite dream. So what if a ten-year-old girl thinks it is dumb. What the hell does she know? I’m the one with a Ph.D. More to the point, I’m the one who can make her watch more episodes, and I will—however many it takes for her to come around. The same goes for my students. From the closing credits, a stroke of genius from Paul Henning, a wave of decency at the end of every episode. Jeffrey Melton (PhD. University of South Carolina, 1993) is an Associate Professor of American Studies at the University of Alabama. He is the author of Mark Twain, Travel Books, and Tourism: The Tide of a Great Popular Movement (University of Alabama Press, 2002, rpt. 2009) and co-editor of Mark Twain on the Move: A Travel Reader(University of Alabama Press, 2009). He has published articles on travel literature, tourism, and humor in South Atlantic Review, Papers on Language and Literature, Studies in American Humor, Popular Culture Review, Studies in American Culture, and Thalia: Studies in Literary Humor. Thanks, Jeffrey, for this post. I happen to love all of Paul Henning’s shows. From what I’ve heard, Paul and Ruth Henning were terrific people all around. Great stuff, Jeffrey! I’ve taught parts of the _Cosby Show_ pilot episode in my Intro to American Studies class (which focused on the 1980s) for many years, and it always leads to interesting discussions of race, class, family, multi-generational identities, and more. Jeffrey Melton wrote this great piece on teaching “The Beverly Hillbillies” as the first piece in his “Teaching American Humor” series. You can click on his name to see more of his excellent posts. Eugene Twombly was married to Beverly Hillbillies regular Bea Benadaret. Bea is a Hebrew and Irish, while Twombly is of New England Yankee stock. I totally agree with this article. I was in 4th grade when I watched the first episode and was hooked.